The Canadian Centre for Occupational Health and Safety (CCOHS) is Canada's national resource for the advancement of workplace health and safety. CCOHS promotes the total well-being - physical, psychosocial and mental health - of working Canadians by providing information, training, education, and management systems and solutions that support workplace health and safety and the prevention of occupational injury and illness. As Minister of Labour, I am proud to present the Canadian Centre for Occupational Health and Safety's (CCOHS) Report on Plans and Priorities for 2015-2016. CCOHS was created to provide reliable and practical occupational health and safety information to assist employers and employees in Canada to be productive, healthy and safe at work. CCOHS is renowned as a leader in providing innovative and authoritative workplace health and safety solutions. For 36 years, the Centre has partnered and collaborated with agencies and organizations from across Canada and around the world to improve the quality and quantity of resources and programs, as well as expand the breadth of usage to many different segments of society. At the heart of CCOHS' work is the fundamental right of all Canadians to a healthy and safe workplace. And we each have a role to play to make it happen. Together, we can help create a Canada in which people can perform their jobs, secure in the knowledge that they are safe from work-related illness, injury and harm. As a leader in the advancement of occupational health and safety, the Canadian Centre for Occupational Health and Safety (CCOHS) remains committed to our mission to address the needs of all working people in Canada. We continue to strive to expand our outreach, user population and impact on Canadian workplaces and provide accessible health and safety information, education and tools to advance the total well-being of workers. We will seek to cultivate new collaborative partnerships, and strengthen existing relationships. There is an effort underway that will continue into the next year, to upgrade our internal infrastructures and improve processes to achieve greater efficiencies and improve the delivery of our services. We are leveraging the use of technology to provide innovative solutions that will increase our breadth of service offerings, including developing mobile apps to help workers assess risks. CCOHS will continue our work to advance and address the issues of psychological health and safety in the workplace, and meet the needs of the most vulnerable segments of our society - young workers, migrant workers - by providing a wide range of essential, credible information, resources and education. I am confident that we will remain a leading workplace health and safety organization by staying focused on our shared vision of success, helping working people across the country and leveraging our collective occupational health and safety experience to provide viable solutions to meet the challenges of the changing world of work. CCOHS operates under the legislative authority of the Canadian Centre for Occupational Health and Safety Act S.C., 1977-78, c. 29 which was passed by unanimous vote in the Canadian Parliament. The purpose of this Act is to promote the fundamental right of Canadians to a healthy and safe working environment by creating a national institute (CCOHS) concerned with the study, encouragement and co-operative advancement of occupational health and safety. CCOHS functions as an independent departmental corporation under Schedule II of the Financial Administration Act and is accountable to Parliament through the Minister of Labour. Its funding is derived from a combination of appropriations, cost recoveries and collaboration with the provinces. It is expected that a portion of the budget will be funded through cost recoveries from the creation, production, and worldwide sales of fee-for-service and revenue generating occupational health and safety products and services. CCOHS has a broad range of collaborative arrangements with many national and international health and safety organizations. These include the International Labour Organization (ILO), the Pan-American Health Organization (PAHO), the World Health Organization (WHO), North American Occupational Safety and Health Week (NAOSH), European Agency for Safety and Health at Work and Health Canada. Further information on the many partnerships is available at www.ccohs.ca/ccohs/partner.html and in our annual report. Collaborative projects serve many purposes at CCOHS. They are opportunities to enhance our occupational health and safety information resources, generate revenues and collaborate with partners worldwide to access and share global perspectives. This collaboration among nations serves to promote the sharing of information and knowledge for social and economic programs relating to health and safety, reduce injuries and illness, and improve conditions for workers. They also contribute to Canada's leadership role in the world and bring the wealth of global occupational health and safety information for use by CCOHS to improve the health and safety of working people in Canada. Improving the national profile of CCOHS and increasing awareness of the available products and services increases general workplace health and safety. Continue the multifaceted communication strategy though webcasts, podcasts, social media, newsletters, media and various outreach initiatives. The goal is to increase the awareness of CCOHS and its offerings and reinforce the Centre’s position as the trusted source for Canadians. CCOHS sells a portion of its products and services in order to recover some of the costs associated with developing and delivering occupational health and safety content to Canadians. An improved cost recovery program will enable the organization to reinvest those resources to develop new products and services, including free public services, ultimately leading to safer workplaces in Canada. CCOHS is rationalizing the product suite that it currently offers and focusing more effort and resources on those products that the Canadian workplaces are demanding. CCOHS is also reviewing its marketing strategy, pricing program and the terms of its commercial arrangements with suppliers to ensure best value. 2Type is defined as follows: previously committed to—committed to in the first or second fiscal year prior to the subject year of the report; ongoing - committed to at least three fiscal years prior to the subject year of the report; and new - newly committed to in the reporting year of the RPP or DPR. 3Type is defined as follows: previously committed to—committed to in the first or second fiscal year prior to the subject year of the report; ongoing - committed to at least three fiscal years prior to the subject year of the report; and new - newly committed to in the reporting year of the RPP or DPR. CCOHS relies heavily on cost recovery programs and contributions from partners to supplement its parliamentary appropriations and cover fixed costs. The CCOHS funding model is based upon 50% of our operating budget being generated through cost recovery and our products and services must be continually updated to be marketable. Changes to our partners’ funding can have a direct impact on our revenues and our ability to deliver our products and services to Canadians. CCOHS is proactively managing this risk by improving its cost recovery program. The program focuses on three main elements. First, we are rationalizing the product inventory to improve focus on the products that our stakeholders demand. Next, we are reviewing the pricing and marketing models for those products to ensure that we are reaching more Canadian workplaces and receiving fair market value for our products. Finally, we are reviewing and revising the commercial agreements with our suppliers in order to help reduce the cost of the operation. The organization also faces the risk that technological advances have rendered traditional delivery methods for its content unsustainable and out-dated. CCOHS has responded by expanding its on-line resources to include more specialized web portals, e-learning programs, webinars, podcasts, Facebook and Twitter promotion and on-line discussion groups. We continue to develop mobile apps to help workers assess hazards and risks. These new channels are key to supporting our priority to expand our reach and impact of Canadians on a daily basis. CCOHS is investing in the technology required to support these new communication channels and is challenged to do so with a very limited operating budget. CCOHS’ funding remains consistent from year to year other than increases for compensation. There have been no increases in funding for compensation in the past two years due to cost containment measures. Fluctuations in funding are primarily due to carry forward amounts and recovery of paylist shortfall amounts for severance pay, parental leave benefits, etc. Spending is impacted by the ability to raise revenues to cover the un-funded portion of the budget. For the years 2012-13 and 2013-14, the total spending includes all Parliamentary appropriations and revenue sources including Main Estimates, Supplementary Estimates, respendable revenues and operating budget carry forwards. 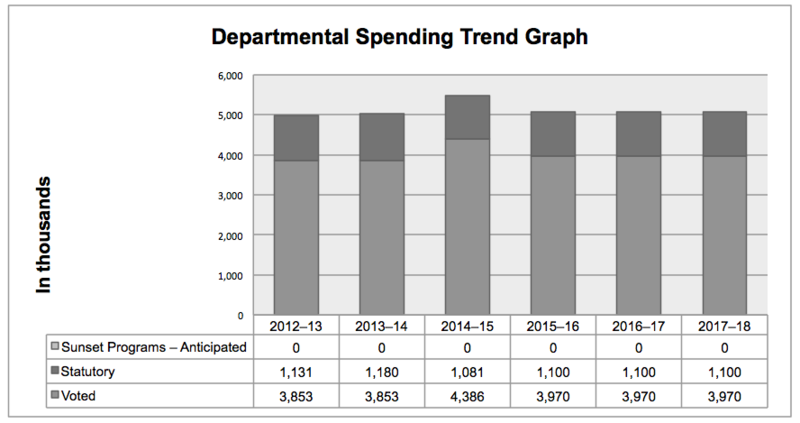 For the 2014-15 through 2017-18 periods, total spending corresponds to planned spending only as adjustments are unknown. For information on the Canadian Centre for Occupational Health and Safety’s organizational appropriations, consult the 2015–16 Main Estimates on the Treasury Board of Canada Secretariat website. Strategic Outcome(s): Improved workplace conditions and practices that enhance the health, safety, and well-being of working Canadians. A more detailed future-oriented statement of operations and associated notes, including a reconciliation of the net cost of operations to the requested authorities, can be found on CCOHS’ website. full-time equivalent: Is a measure of the extent to which an employee represents a full person year charge against a departmental budget. Full-time equivalents are calculated as a ratio of assigned hours of work to scheduled hours of work. Scheduled hours of work are set out in collective agreements.